Football or soccer is the most popular sport in the Basque Country. 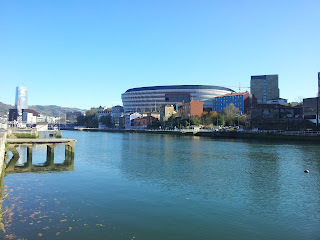 If you visit the Basque Country and you are a football lover, apart from seeing the unique Basque culture, you will probably love to complement your visit with a visit to the stadiums or the places where local football fans meet. Bilbao Athletic Club is the best known Basque team all over the world and the fifth Spanish team in number of members after Real Madrid, Barcelona, Atletico de Madrid and Valencia. Bilbao Athletic Club was one of the first football teams in Spain, created by some English living in the city in 1898, and traditionally, it has only Basque players. If you want to visit the Athletic stadium, known as the "Cathedral of Football" or San Mames Barria it is placed in the west of the city. Best way to arrive is by Licenciado Pozas street. In this street, you can enjoy the club matches with locals (check my previous post about best places to enjoy a football match in Bilbao). The atmosphere is great both before and after the match, friendly, happy and easy going. The new stadium, San Mames Barria by Cesar Azkarate architect, has been opened in 2013. The old museum of San Mames is still to be prepared so that there are not visits inside yet. You can also visit Ibaigane Palace, which is the official head quarters of the Athletic Club, next to the Guggenheim Museum in Alameda Mazarredo Street, 23 open from 8am to 6pm from Monday to Friday. Of course, best experience would be to enjoy a football match in this stadium where "Lions" play. Second football (soccer) team in number of supporters in the Basque Country is Real Sociedad, which represents the beautiful city of San Sebastian. Anoeta is their stadium, with a capacity of 32,000 people and classified as one of the best arenas by UEFA. Anoeta Stadium in San Sebastian and its museum can be visited during the whole year from Tuesdays to Saturdays from 10.30am to 1.30pm and from 4.30pm to 7.30pm. There are more than 58 other soccer teams in the Basque Country, we can also mention Deportivo Alaves (in the Basque capital of Vitoria-Gasteiz), Osasuna (in Pamplona) and Sociedad Deportiva Eibar (also playing in First Spanish League La Liga).